We have a lot of conversations with potential clients about the choice of a content management system, and for good reason! 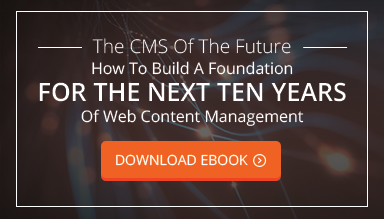 Whether or not you can write code, a CMS is the most efficient way to manage a site, so it will be one of the most important choices you make during the early phases of your project. New Possibilities Group works with most of the major, off-the-shelf CMS options, and there are situations where a specific CMS is most appropriate. Nonetheless, we usually recommend that clients employ a custom web development solution, especially if the new site is feature-heavy. While popular, open-source platforms like WordPress and Drupal have a large ecosystem of plugins and modules that can handle many common situations, they will often require customization to meet your exact use case. Plugins can get you 90% of the way there, but a developer could spend many hours of development to customize them to meet your needs 100%. And since plugins are typically created by 3rd party developers, customizing them tends to get messy, so it’s usually the site itself that ends up having to change. Custom-built functionality can accomplish your goals without the need for compromises to build the site around the plugin, rather than the other way around. When you custom-develop a new feature, you can remain confident that it will continue to work. Plugin and module maintainers come and go, and it's not unheard of for plugins to fail on updated versions of WordPress or Drupal or for the plugin maintainer to drop the project. WordPress is the biggest fish in the sea when it comes to out-of-the-box options and as a result, a WordPress-powered site will often be targeted by automated bots. Drupal is more secure, but presents similar issues on a smaller scale. On the other hand, custom sites—like those built on the NPG Framework, for example—are not common targets. Vulnerabilities will likely be limited to those that are targeting your site specifically, rather than the system on which it’s built. It's no accident that none (that's right, zero) of the sites built on the NPG Framework have been hacked in the last 15 years. Off-the-shelf systems are built to accommodate a multitude of different site admins and users. In most cases, this calls for a one-size-fits-all setup, which may not always work depending on a company’s internal workflow. While it's possible to customize the admin area of any CMS to fit your particular needs, most site owners do not want to (or can’t) spend the resources necessary to do so. They’re then forced to work with an interface that allows for hundreds of different possibilities when really, most internal users will only need to update specific types of content. The possibilities with a custom CMS, on the other hand, are as varied as your imagination. Budget permitting, you don't have to build your site around someone else's idea of how a site should work. For example, the NPG Framework is built around the exact content that you will want to create and edit on the site. The admin interface will include exactly the tools you need, no more and no less. You can also easily hide tools for specific users, so your blog editors don't have to look for their blog posts amidst the clutter of e-commerce reporting and product management.